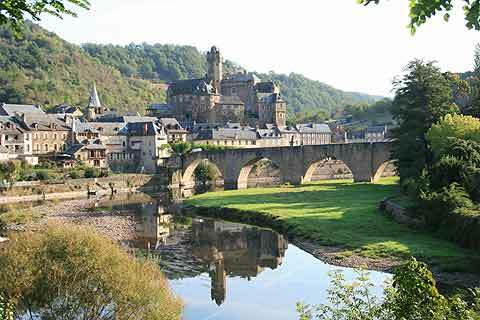 Estaing is a village about 25 kilometres north of Rodez, in the Aveyron department of the Midi-Pyrenees. 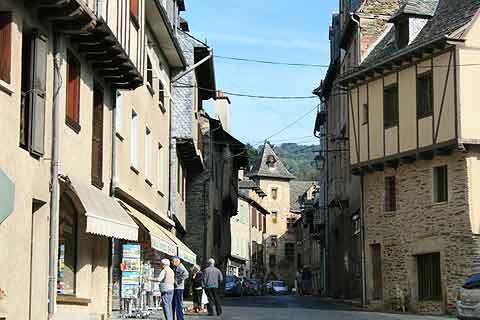 The village has qualified as one of the 'most beautiful villages of France', and is in a lovely setting at the base of the Aubrac mountains and at the mouth of the the Lot River gorges in the northern part of Aveyron. 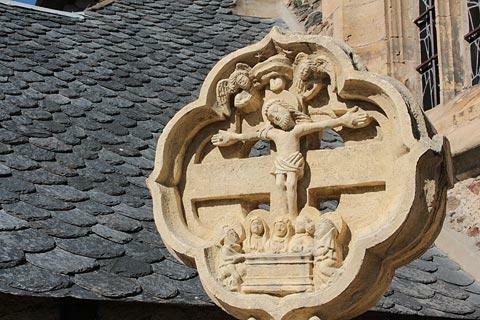 The village is on the route of one of the important pilgrim trails to Santiago de Compostela, in part because the relics of Saint Fleuret are situated in the village church. 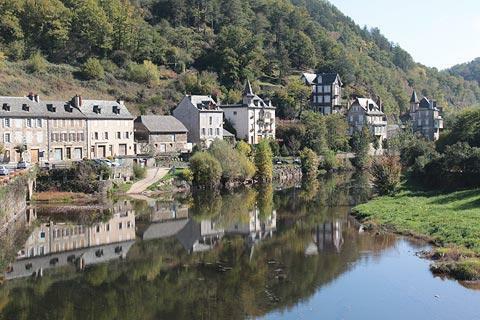 The centre of the village is pleasant to explore but the highlight in Estaing is the views across the village from along the river, from where you can see the castle, the bridge and the houses along the riverside all at the same time - beautiful! 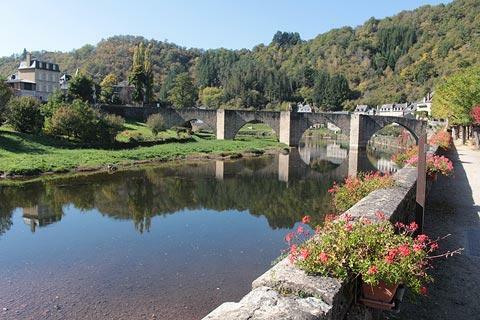 Before you start exploring the centre of Estaing take a stroll along the river bank, and across the bridge in the centre of the village: the bridge was built in the 16th century and is a listed UNESCO World Heritage site as part of the pilgrim route to Santiago de Compostella. The southern end of the bridge has lovely views of the village and you can also see the small Chapel du Pont, built in the 18th century to replace an earlier oratory. 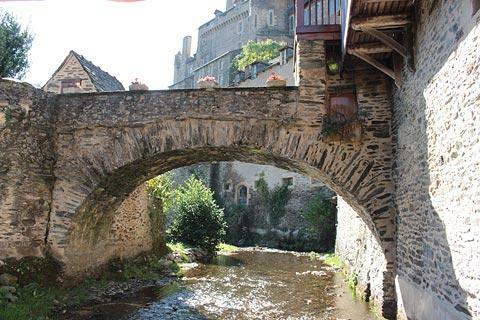 From the northern end of the bridge you can follow the Rue Francois d'Estaing into the heart of the village. The Tourist Office of Estaing is also along this road in a Renaissance style 'College' that was built to house six priests from the Saint-Jean fraternity. It has a lovely wooden door with the coat of arms of Estaing engraved above it. 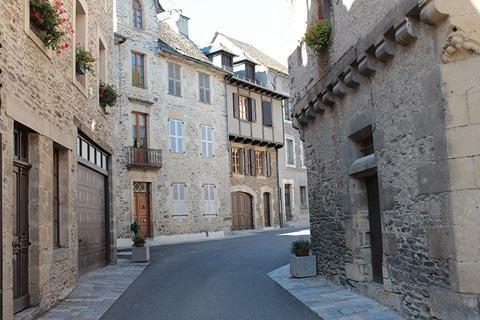 You can follow the streets behind the tourist office to see the charming historic areas called Abiouradou and Barry. 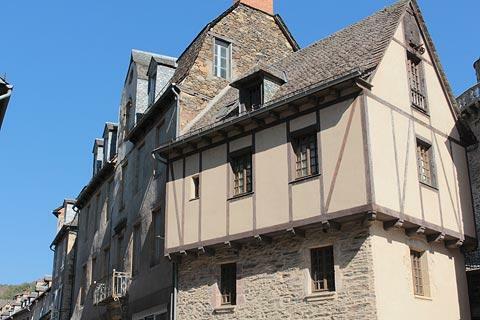 Between the two on Rue du College you can see the Hospitalité Sant-Jacques, a large bourgoise mansion built in the 18th century as a school and now used to welcome pilgrims: about 1 in 3 visitors to Estaing are pilgrims, and the Hospitalité Sant-Jacques will stamp your pilgrim passport for you. Keep exploring the streets and you will soon reach the church, at the top of a flight of stairs near the entrance to the castle. 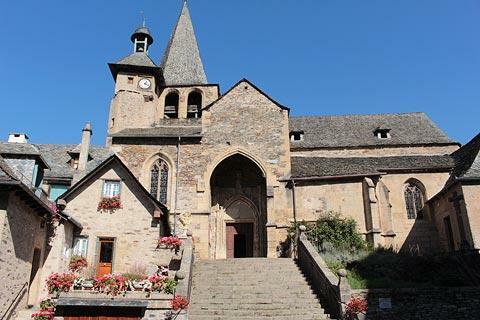 The Church of Saint-Fleuret in the centre of Estaing was built in the 15th century on the site of an older priory, and also holds two or three important works of art, in addition to the 15th century stone cross outside the church. The church is unusual because it has both a steeple and a bell-tower. In the wall to the right of the church you can still see the windows in the wall of the crypt of the original church. From here follow the Rue du Pont to the right of the church which leads you to a group of houses around a pretty bridge across the river Coussanne which converges with the Lot River in the centre of Estaing, and continues up the hill to a viewpoint with lovely views across the centre of Estaing. 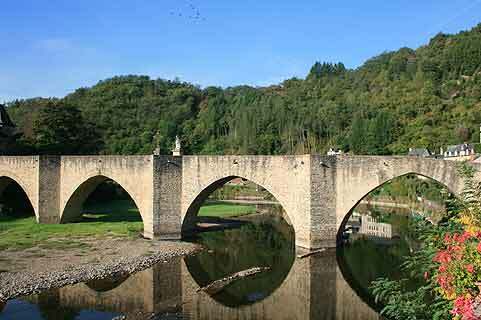 Originally four medieval bridges crossed this river allowing villagers to get to their gardens on the left bank. Two of these bridges still remain. 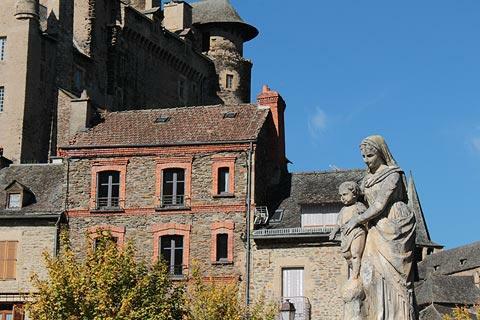 The village is dominated by the Chateau of the Estaing family, as it has been since the founding of the village in the 11th century. The castle was owned by the Counts of Estaing for eight centuries before being lost to the Estaing family after the revolution and becoming a religious centre from 1836 to 2000: during this period the chateau was also restored. 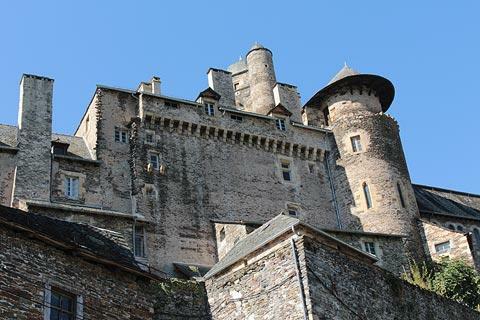 Since 2012 the castle is again owned by a foundation owned by the Estaing family, who have reacquired the chateau, carried out further renovations, and opened it to the public. Various rooms are now furnished and open to the public and you can also see an exhibition dedicated to President Valéry Giscard d'Estaing, President of France from 1974 - 1981. The Chateau d'Estaing is open from 2 May to 14 October, closed on Sundays in May, June and October, and closed on Mondays. Closed for lunch 12.30 - 14.00. Admission six euros, or ten euros for a guided visit. The first Sunday of July is the day for the fete of Saint-Fleuret, celebrated in the village since the 11th century with a costumed procession. If you are in the region around the 15th August try not to miss 'la nuit lumiere' when all the village and the bridge are lit by candlelight and later there is a firework display in the village. 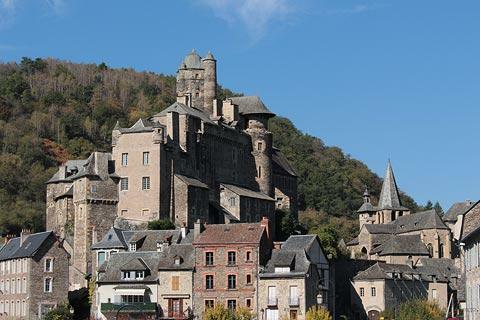 The second weekend of September is another date for the diary: this is Estaing's medieval weekend when all the village wear medieval costumes and various medieval activities take place in the village. 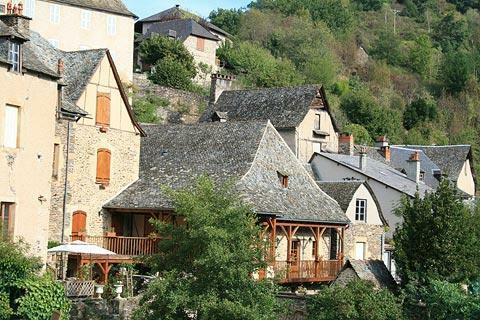 On the edge of the village is a wine co-operative where you can taste and buy wines from the Estaing area. 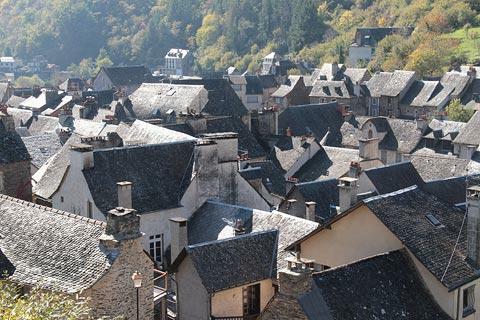 The setting of Estaing, surrounded by gorges, mountains, crashing streams and rivers makes it the perfect place for a wide range of outdoor activities, including walking, cycling, fishing and canoeing. The village forms part of the upper Lot Valley. 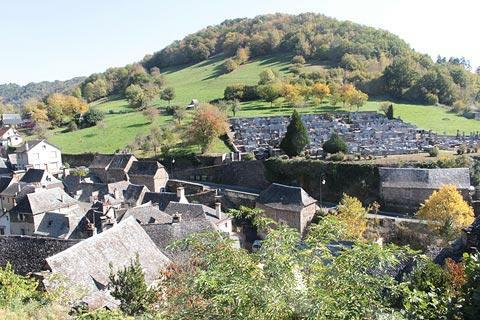 Among the many villages to visit in the region there are three close to Estaing that are listed as 'most beautiful villages of France': Saint-Eulalie-d'Olt and Saint-Come-d'Olt to the east and Conques (our personal favourite) about 20 kilometres to the west.